This year in Budapest, Mesi met Parvinder Ji – a teacher from the Sikh tradition – during his tour of the world. Yesterday, we were lucky enough to have two hours of his time as he showed us his home city Amritsar and the Golden Temple. Parvinder has an incredible presence. Physically he is striking: tall and slender, he has a face that radiates kindness. There is a subtle majesty about the way he holds himself that commands respect. This is not respect that derives from authority, or age. Rather it is a rarer form, one that is granted when you recognise someone who is a model for the type of person you wish to be: wise, compassionate and graceful. Yet at the same time Parvinder is very humble. When we asked him whether he was busy teaching, he smiled, flipped roles and said that instead he was ‘busy learning’. It is this mix of humility and majesty that makes Parvinder a true inspiration. 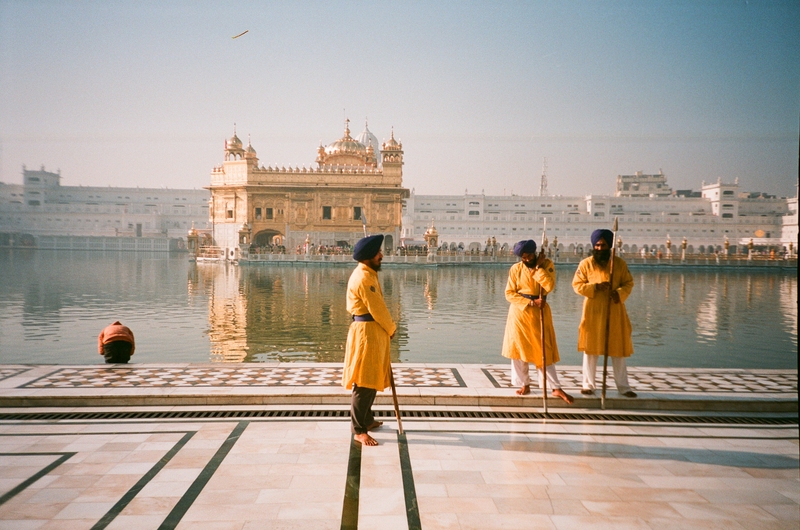 We met Parvinder on the roof of our hotel, which overlooks the Golden Temple. After greeting us warmly, he began to talk about the significance and symbolism of the building – notionally, the holiest place of Sikh worship, but also I believe, one of the most spiritual places on earth. At the shallowest level, the temple is a very beautiful building. With a bottom level made of fine marble and upper levels of gold, the temple shines in the middle of massive, man-made lake. A bridge connects the temple to the outside courtyard, also marble, that encircles the water. The entire complex is undoubtedly and deeply beautiful. However, it is what it represents to the estimated 100,000 visitors per day – far beyond its material beauty – that embodies the true value of the temple. 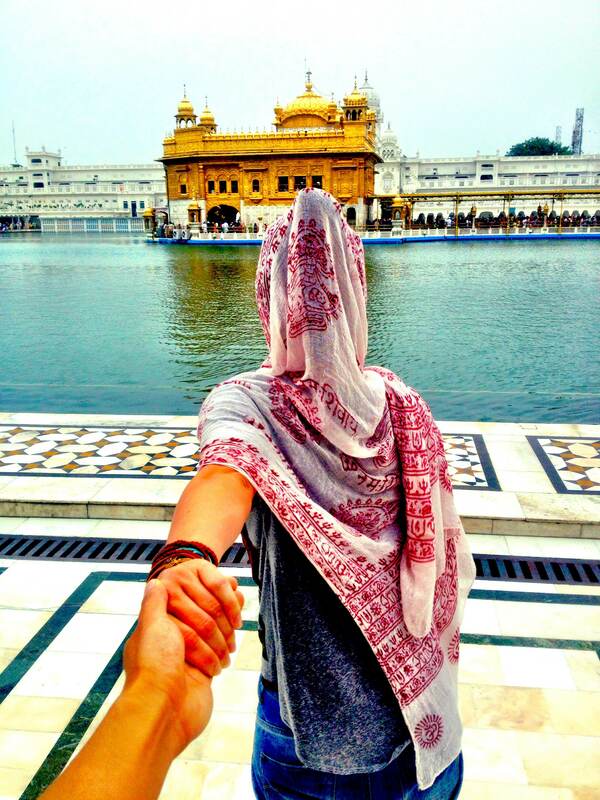 If the Taj Mahal is an expression of one man’s love for one woman, then the Golden Temple is the infinite expansion of that thought – for it represents the deep, connected love we all share for the divine. The essence of Sikh religion is unity. 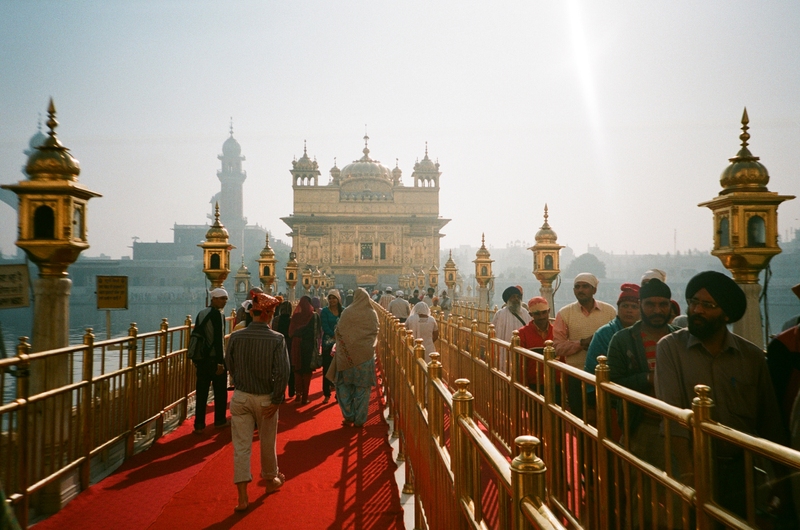 While many religions are exclusive, Sikhism is open. It tries to create togetherness, rather than division. Inside the temple this unity is apparent. There is a band consisting of two harmoniums and drums that plays continuously – literally 24 hours a day – while the same performers sing mantras. It is lively and loud inside, and the music flows from one song to the next. Worshippers pour in, pray, meditate and some nod their heads to the music. It is like the universe’s most profound jam session. Within the greater complex one can find people engaging in spiritual practice in all sorts of ways: from bathing in the waters of the tank, to sitting in peaceful meditation, to bowing in front of the temple. Nearby, there is a large eating hall where free meals are served throughout the day to rich and poor alike. 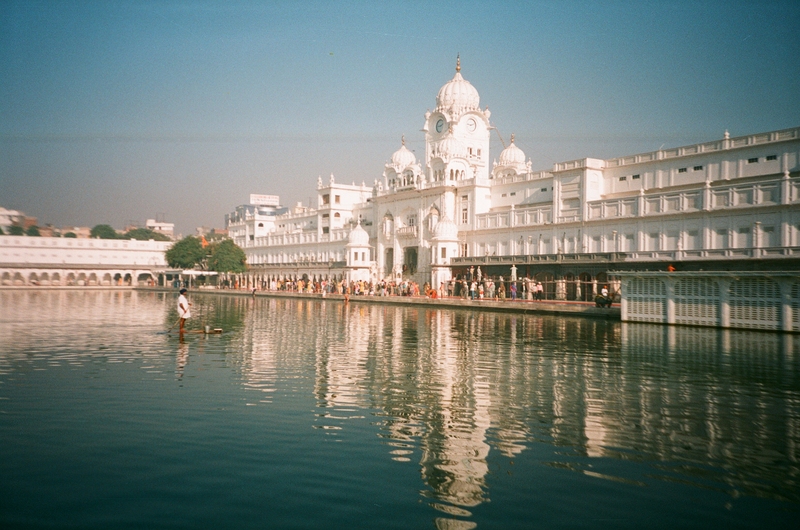 While much of the attention is on the Sri Harmandir Sahib and Amritsar – it is but one of five ‘sars’ or holy tanks in the city. We walked with Parvinder through a garden to the second sar – Kaulsar, which is named after a deeply spiritual woman from Lahore who was taken in by one of the Sikh gurus. During this extended walk he told us about his orphanage, where he has adopted 9 girls to save them from forced prostitution. His ambition is to adopt 900 girls. He also showed us his recently purchased home, which he hopes to turn into a guest house, and we met his brother – a manager of the family textile business. As we walked, many people greeted him in the street and it was apparent that Parvinder is well known and loved in Amritsar. Eventually we ended up at his favourite street-food stall and he shouted us to samosas, special Punjabi chutney and gulab jaman. This was what made the tour so great – it wasn’t just a tour of spirituality, but also one firmly grounded in the experiences of everyday life. In this way it made it obvious that reaching a mature state of consciousness is possible for all, not just cross-legged cave-bound sadhus. We were very lucky to be granted such insight, and even more so to spend time in the presence of a great man, explaining to us the deepest and most profound aspects of his spirituality. This is the juice of India. * There are 11 Gurus in the Sikh tradition. Amristar was founded by the fourth – Guru Ram Dass and completed by the fifth Guru Arjan. After the death of the 10th Guru, Guru Gobind Singh, he left the ‘guru-ness’ onto the book he put together, the Siri Guru Granth Sahib. ** The Siri Guru Granth Sahib is the 11th Guru of the Sikhs. While the physical appearance of the Siri Guru Granth Sahib is a book (or books), it is considered as their Guru (Guru is a term for teachings embodied, someone or something that leads you from darkness to light). *** The very beginning section of the Siri Guru Granth Sahib is known as the Japji Sahib. According to Yogi Bhajan, it is the perfect template of infinity captured in the rhythms, content, tones in the Siri Guru Granth Sahib. The Siri Guru Granth Sahib is a highly sophisticated experience of mantra.